But. Last year, some blasted, nasty, hateful vermin dug into the ground and ate the root of my middle azalea. CRY! I don't think I'll ever find the exact bush I have, let alone one this big. These have been growing for five years now. PLEASE help! Anyone have any idea what this is? We thought maybe a chipmunk? A vole? Help! OK, onto the chairs! I've reupholstered many a chair in my day --in a matter of minutes, and with very little fabric, you can transform the look of a room by recovering your chairs. I did our SIX dining room chairs with less than two yards (and the seats are big!). I wanted to do the same with our kitchen island chairs, but kept hesitating because they weren't upholstered to begin with. I don't know why I was worried -- I've covered headboards the same way, and toy boxes. Then I saw Kate did it too, and I was sold. See that price tag? Garden Ridge baby! (Buy one get one half off -- total of $120 for two counter height chairs.) Reattach to the seat and you are DONE folks! ARGH! I hate when I forget my own advice!! I'll be touching that up with hot glue. Dang. Stay tuned -- next week is the one year anniversary for my blog! I have a fabulous (I think anyway!) giveaway planned! Love the fresh pop of green! Very nice job! Nice n soft now.. I forgot to mention the vermin question. I sure do hope you don't have moles. You did mean moles not "voles" right? HEHE. I've read another blogger's post saying she has been trying to rid her yard of them for three long years. Yikes! Look at you! You always amaze me. I'm surprised at how easy it was to use the foam. I've been kind of scared of foam too...can't really tell ya why. I'm sorry about your rodents. I have no idea what they are, but I feel for you. No Melissa, there are moles AND voles!! I'm serious. :) I didn't know either till last year when I was trying to figure out what it was. That's a beautiful job!Your kitchen is awesome! They look great!! I love your blog. Thank you for all the ideas you share with us. We call them gophers. We have them too lately much to our dismay! My pest control neighbor just put something down our holes that they supposedly eat or get on them and it makes them die. It wasn't expensive either. Good luck! And I love the new look in your kitchen. Looks GREAT! Love the fabric you use to upholster the chairs. Love the chairs. The whole island is just unbelievable. Hey I think our barstools could be cousins! They look great! We have a pretty large yard, and it looks like a ground squirrel hole. We fight with them ALL summer long, and they're nearly impossible to get rid of. I was watching a hole one day and 9 of them came out of one hole!!!! I don't know if it's a mole--they don't usually make such a clear cut hole. That's all the rodent advice I have for you. :) Good luck! Lawn/garden rodents, ahh I know them well. You have a vole or voles. Moles will dig tunnels, as do voles, but moles dig closer to the surface and leave ridges in the lawn as well as cone shaped piles of dirt where they come up, where as voles dig deeper and leave the holes as you pictured. Moles are looking for grubs, the larvae stage of japanese beetles, in the lawn. Voles eat plant roots, thus your dead azalea. Now the trick is how to get rid of the little sucker! There are a few home remedies I know of that are going to sound CRAZY! 1. Drown them in the tunnel. Take your water hose, put it in a hole in the lawn, not in the bed with the azaleas (it's too much water going in there) and run the water filling up the tunnel to try and drown them Works sometimes if they haven't dug a massive tunnel system yet. 2. Juicy fruit gum. Look for every hole you can find and stick a piece of gum down into the hole. They are drawn to the sweet smell and eat it. They can't digest it and it eventually kills them. 3. Go to a local garden center, not something like Home Depot, and get a product called Mole X or Mole Rid (sorry can't remember exactly what it's called) that worked for voles. You put a spoon full in any hole you can find, It's a poison that will kill them. Do it when you have a few dry days, otherwise it just dissolves and does no good. Well class that was your gardening lesson for today. Can you tell I'm a gardener? Sorry for the loooong post! Chris I hope they aren't squirrels -- I have heard they are impossible! We've never seen anything come out so I think it is the vole. And yes, our chairs do look related!! Chipmunks also make holes in the ground like that, but I don't know about them eating plants. It does sound like a vole. Love your new stools! I didn't even know that it was possible to add foam padding to chairs. Thanks for the great idea! LOVE what you did with your stools (and the whole island, duh). But I'm more excited about the stools because you did things I tell myself "couldn't" be done... and here you go showing me I'm just an uncreative frady cat. Thanks, seriously! Sarah I came back to see if you answered me and you did. You sure have me curious now. I've never heard of a "vole". I'll be doing some google searches. They look great!! I'm starting to think it's my computer, b/c it happened on a blog yesterday, but I cannot see half of the pictures in this post! Is it just me?? I actually looked at my dining room chairs yesterday and knew that I needed to recover them. Thanks for the tutorial!! OMG!!!!!!!!! You are so brave nd so wonderful for sharing that info!!!!!! Guess what I am doing this weekend......!!!!! Oh yeah baby !!!! That's for the island stools, darlin. Gorg fabric, I love it. Don't know what creepy crawly furry germy thing is crawling in your amazing azaleas, but I'd be totally freaked out too. LOVE the redo! That ROCKS! As for the azaleas--they ROCK too! Beautiful!! The critter? If it is a MOLE--I know nothing of voles? !--then stuff human hair in the hole. They hate it. Google how to get rid of them...there are all sorts of traps and stuff but actually human hair works great (steal from your fav salon!) But if it was moles, I'm sure you would have those lovely mounds all over your yard, making it looks similar to something in Baghdad these days? Anyhoo...good luck and FAB job on the redo! Love your island and especially what you did with your chairs! I'm going to look closer at my dining room chairs to see if I can do that to mine. Thanks for the inspiration and good luck chasing the critters away from your azaelas! I love the chairs. The island looks so fantastic! About the rodent, I am not the one to ask, but if you get and answer let us know! Your island and chairs look fabulous! I love the transformation. Thanks for sharing! Chairs are beautiful--love the green and black combination. Good luck with your rodents. We had the same thing at our last house and I think they must have followed us to this one! Your azaleas are gorgeous. I have about 30 around my yard! They're my favorites! I'm loving the beadboard as well - thinking about using it as my backsplash when we put in new counters later this year. stools??? You are my new hero!!!!!!!! Very interesting. I think my chairs are so stinkin' uncomfortable with no padding. I've been trying to figure out how to make a proper cushion. I'll have to check this out and see if it would work on my chairs. I need me some bar stools- too cute! Question: are those lemons real or fake... if fake where did you find good looking ones? OMG!!! I have the same darn holes in my garden beds and I thought it was a squirrel! I'm totally going to flood/gum/poison them!!! Watch out, evil little voles! Oh, and I love your chairs. Great idea! I may have to copy you! Could be a gopher as well. We get those around here in more rural neighborhoods. I love your site! Such an inspiration! My husband probably hates that I follow your sight...costs him too much money! Love the chairs, I might just have to do it with mine! Not sure what you have, but if it is gophers you can get rid of them by putting Juicy Fruit Gum into their holes...sad yes, but it kills them. Good luck figuring out what it is! I think it's a chipmunk. I have holes like that too. A few years ago it ate the roots of one of my biggest oak leaft hydrangeas! This year they've made holes/nests in our pond and we had a leak so bad we had to dismantle the whole pond. I know people think they're cute but they really are very distructive. We've caught a few of them over the years. i am sooo gonna redo my barstools! YES!! thanks for the info. Also, what do you suggest I use to paint the barstools, not sure if i want to do black or white..spray can or brush? any hints? That looks awesome. I love the pattern you chose. 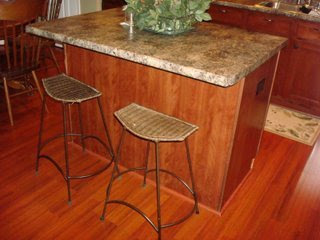 I hope to go find a nice pattern this weekend for my barstools and also a paint color I want! LOVE those green barstools! Mine have always been too tall, and I'd never thought to cut them down...DUH! I tell ya what...you're always good for something! I love it! You are an inspiration to me. I bought a goodwill chair that is sitting in my garage. I heop to paint and reupholster it. Sorry about your azalea, I hope it does get the other ones. Your chairs look great, I love the colors in your kitchen. Ugh, I meant to say I hope it DOESN'T get the other azaleas. Sorry you lost one of your favorite plants! Our house had some lovely things but the previous owner neglected it for about 15 years and we just couldn't get rid of all the terrible prickly vines and monkey grass that had invaded, no commandeered, the beds. Landscapers all said we'd have to tear it out and start over. Which is expensive so now our yard is empty. ANYWAY you are lucky that if it had to happen, it happened to the middle one. Now you can pick out a showcase plant for that spot, once you kill the critter that is! And if I didn't say so the other day the island looks great. HATE peeling paint, but it is durn hard to paint that fake stuff! Love the island redo. Makes me want an island even more. Thanks for the tips and ideas! Okay, that really looks like a chipmunk hole. There is another way as well. This is so terrible that I almost want to post this as anonymous, but you can put a house on the tailpipe of your car (in the open air, of course!) and run the end of the hose into the holes... and um, let those furry lil' varmits just go to sleep. (Push up daisies...? Take a dirt nap...? You get the idea.) Good luck! Fox urine. I know it sounds weird, but we had this problem in our yard last year. Go to a hunting supply store or a seed and feed and buy fox urine (they won't look at you like you're crazy, I promise!) and then spray or pour it around any holes you see. Rodents are scared of foxes and the smell makes them leave your yard. Your island keeps getting better and better! We have gophers here. They thrash the yard but they are so stinking cute I can't kill them. I should get something to stick down in the holes. Most people here flood them out and whack them with the shovel. I can't do that! Hi there...I'm not a decorator or a crafty person really, but I stalk the blogs of them =) I just thought I'd let you know that I JUST recovered some chairs in my dining room in that same EXACT fabric! I haven't blogged about it, I need to, but how funny that it's the same. I also bought another floral fabric I loved at the same time so I did the two end chairs in that fabric, it coordinates well and I put a green piping around all the chairs when I was done! And ps...our bar stools are too high too, I'm going to take your advice and make my husband cut them down =) I hate sitting there cuz my legs don't fit underneath so it's just a place for the kids right now. No idea about the holes... sorry. But those chairs are. to. die. for. Another job well done sister! Wow, one year already! You are such a "tool girl", I want my own saw! Love the chairs. Oh, and that sounds like a chipmunk to me! Your chairs look great. As for your rodent...what about a mole? Do you have those around where you live. I'm in Utah and our neighbor has one that made its way over to our yard last summer. The "holes" in our lawn looked just like that. I have a question unrelated to this post. Where did you get your beautiful window boxes. Did you make them? So cute...I NEED to find some (inexpensive) chairs for our island too! It looks fabulous! I wish I had the time and patience to redue my kitchen. So many projects to start. Fabulous job! Check out my HUGE Reupholstery project going on on my blog now. I have been a stalker for quite sometime and don't know if I have ever commented, but I wanted to tell you I think the island is FABULOUS! I love the beadbord look and LUVE the padded chairs! Great job! Thanks for all the inspiration. First, your chairs (& island) look amazing!!! I can't believe you just cut 2" off the stools... good idea - I always envisioned the whole cut one leg shorter so cute the others to match and cut one shorter and you keep cutting until you have no chair. Ha ha. It sounds like your readers solved your problem. I am currently battling moles. Ugh, ugh, ugh. They are tearing up our lawn and they have eaten a few roots of my plants. I thought the island transformation looked great before, but the touch of green really adds a lot to it. The chairs look fantastic! Very crisp and comfy. I've only been brave enough to upholster a little footstool - I may have to tackle something bigger some day. I'd say your rodents are voles! Those are the definitely the ones who eat the roots. I trimmed back my pampas grass and found a whole nest of them in the base. Luckily my dog and cat were right there with me and we (meaning they) managed to catch a couple! Nasty creatures! I must concur with the others saying that they are voles. Voles love to eat roots. A wise older woman in our neighborhood told me to plant using a big mesh framework in the ground before I would put my shrubs or plants in the ground. The voles can't get through the wire mesh yet roots can grow out of it. Since this advice I have yet to pull out a shrub without roots. Good luck! Pass on any other ideas for dealing with them! Good to know. I have a question though. I am needing to recover some chairs that already have apolstered seats. Anything to keep in mind when choosing fabric? Cotton, polyester, canvas? Print, solid, stripe? Moles! Yuck! We've got 'em too. You can buy traps that kill them with a sharp stake as they come up out of their holes or you can try a sprinkle on lawn treatment that kills grubs....the mole's main food source...aside from flower roots and bulbs of course. I've also heard that Wrigley's spearmint gum stuck in the holes kills them....something about their digestive tracks not being able to handle it. Good luck! ummm I am late posting, but did you think it might be a gofer? my hubby had to set traps for his mom this last year...no fun. they are sneaky and dang smart. One more thought on your rodent. I know it is not a mole and not a gopher. Vole? Maybe. My guess? 13 Striped Ground Squirrel. They make shallow tunnels just a few inches below the ground. They never leave dirt by their holes. They love to eat roots of plants. They love well-manicured places, like lawns, golf courses, etc. They like to tunnel along houses. We have had them here and we did exactly what another of your readers suggested. We filled their tunnel with water then waited a few minutes for them to stick their soggy head out then my husband (I would never be able to do that!) wacked them with a shovel. Free and it works! They have not been around for a couple of years! About half way down is: What's eating your garden? This is also a great company for gardening supplies, I have tons of their products and love them. They make the BEST gardening gloves I have ever used ( and I have gone through a lot of them over about 40 yrs. Of gardening) and they are reasonably priced!